Looking for the great produce deals this week? 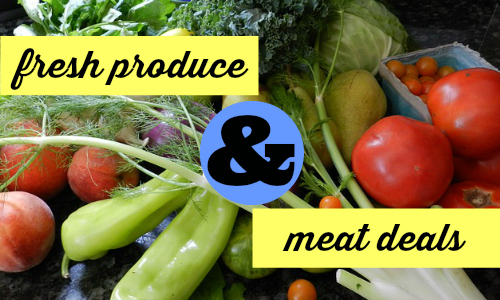 You can find fresh meat and produce deals in Bi-Lo, Publix, Kroger and Harris Teeter. Plus, if you are following the Whole30 diet or Paleo diet, this is a great list for you! Note: I have tried to create the most accurate meat and produce deals that would fit into the Whole30 or Paleo lifestyle, but each person is different and will need to decide which of these items fit your particular diet. Publix – Mango, $1 ea. Publix – Red Delicious Apples, 5 lb, $1.99 ea. Bi-Lo – Hass Avocados, $1 ea. Bi-Lo – Mangos, 99¢ ea. Bi-Lo – Fresh Limes, 33¢ ea. Kroger – Avocados or Mangoes, 99¢ ea. Harris Teeter – Cantaloupe, at $3.99 ($1.99) ea. Harris Teeter – Organic Mangoes, $1.50 ea. Harris Teeter – Hass Avocados, $1.25 ea. Publix – Corn, 33¢ ea. Bi-Lo – Corn on the Cob, 33¢ ea. Bi-Lo – Broccoli, bunch, $1.99 ea. Kroger – Red, Yellow or Orange Bell Peppers, $1.50 ea. Kroger – Sweet Corn, 33¢ ea. Harris Teeter – Organic Green Cucumbers, 99¢ ea. Harris Teeter – Iceberg Lettuce, 99¢ ea. Harris Teeter – Cucumbers, 59¢ ea. Harris Teeter – White Corn, 50¢ ea. Harris Teeter – Hot House Cucumbers, $1 ea.